Welcome to The College Investor Tax Help Center. We know that taxes can be challenge. There are a lot of "rules" to follow, there are a lot of software options, and there are a lot of scams to avoid. That's why we put this tax help center together - to put our best tax content in one single place. 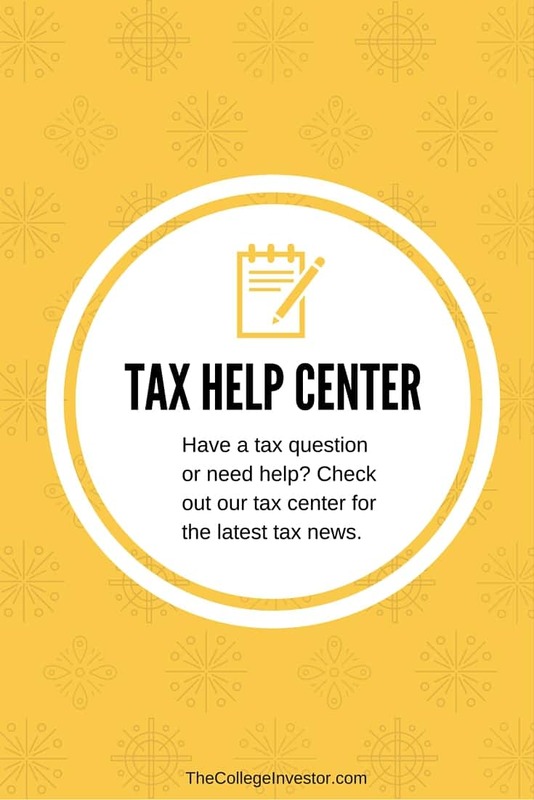 Whether you're getting ready to prepare your tax return, or are waiting on your tax refund, here is what you need to know about taxes. From picking the best tax software, to getting prepared to file your return, to dealing with any potential problems after the fact, here's everything you need to know to make your tax filing easy! When you're preparing to file your tax return, you need to make sure that you're focusing on the right areas. Here are some key reminders when preparing to file your return. 1. Preparing Your First Tax Return - If you've never done it before, here's what you need to know. 2. Millennial? Here are the top tax tips for millennials and young adults. 3. Which is better - a tax credit or a tax deduction? We explain the difference and show you why you should be focused on maximizing your tax credits. 4. Should you go to a paid tax preparer or do it yourself? This is a common question, and we believe that most tax filers should do it themselves and save hundreds of dollars. 5. Early Tax Filing Tips To Get Your Refund - If you're expecting a tax refund, it's best to file as fast as possible. You don't need to let the government hold your money any longer! 6. How To Get Organized For Taxes - The biggest trick to making tax time easier is to keep organized with all of your financial and tax related documents. Here's our tax document organization strategy to make filing easy. - What If I'm Still Waiting On Tax Forms? It happens - some companies are really slow to mail out certain tax forms, and others (such as K-1s) aren't even prepared until March. Here's what you need to do if you're missing a tax form. - Beware: REITs often issue corrected 1099s. Here's what you need to know and how to prepare. There are a lot of options when it comes to filing your tax refund. Here we compare the best tax return software options for your needs. TurboTax Review - TurboTax is one of the most popular and well know tax software programs. We like TurboTax's interface, but it's higher price makes it hard to justify compared to other options. H&R Block Review - H&R Block is another one of the "Big 3" tax companies. They have a sleek interface but are priced in the middle of the road. They don't offer help and try to get you to their offices. Their software this year is okay. TaxAct Review - TaxAct is the cheapest tax software option of the "Big 3" tax companies. They beat the competition on every tier. Their interface is a little hard to navigate, but otherwise they offer a great product for the price. TaxSlayer Review - TaxSlayer really stepped up their game in 2018, and we love what they've done. They are our recommendation for side hustlers this year, and they are one of the only companies to offer an online tax refund anticipation loan. ​Credit Karma Tax Review - I included this here because it's a popular tax filing option. However, it's not one that we recommend this year. There have been users reporting bugs, it doesn't support self employment retirement plans, and has poor customer service. Once you've filed your tax return, here are some of the most important topics to keep in mind.